A thermometer is a device that measures temperature or temperature gradient, using a variety of different principles. The word thermometer is derived from two smaller word fragments: thermo from the Greek for heat and meter from Greek, meaning to measure. A thermometer has two important elements: the temperature sensor (such as the bulb on a mercury thermometer) in which some physical change occurs with temperature, and some means of converting this physical change into a value (such as the scale on a mercury thermometer). Industrial thermometers commonly use electronic means to provide a digital display or input to a computer. Internationally agreed temperature scales are based on fixed points and interpolating thermometers. The most recent official temperature scale is the International Temperature Scale of 1990. It extends from 0.65 K to approximately 1,358 K (−272.5 °C to 1,085 °C). Various authors have credited the invention of the thermometer to Abū Alī ibn Sīnā (Avicenna), Cornelius Drebbel, Robert Fludd, Galileo Galilei or Santorio Santorio. But the thermometer was not a single invention, it was a development. Philo and Hero of Alexandria knew of the principle that certain substances, notably air, expand and contract and described a demonstration, in which a closed tube partially filled with air had its end in a container of water. The expansion and contraction of the air caused the position of the water/air interface to move along the tube. Early air thermometers, instruments used to measure the hotness and coldness of the air with a tube in which the level of water is controlled by the expansion and contraction of the air, were developed by the Muslim scientist Abū Alī ibn Sīnā (known as Avicenna in the West) in the early eleventh century, and by several European scientists in the sixteenth and seventeenth centuries, notably Galileo Galilei. As a result, devices were shown to produce this effect reliably, and the term thermoscope was adopted because you could see changes in sensible heat (the concept of temperature was yet to arise). The difference between a thermoscope and a thermometer is that the latter has a scale. Though Galileo is often said to be the inventor of the thermometer, what he produced was a thermoscope. 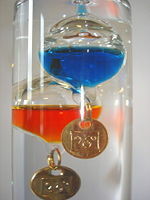 Galileo also discovered that objects (glass spheres filled with aqueous alcohol) of slightly different densities would rise and fall, which is nowadays the principle of the Galileo thermometer (shown). Today such thermometers are calibrated to a temperature scale. The first clear diagram of a thermoscope was published in 1617 by Giuseppe Biancani: the first showing a scale and thus constituting a thermometer was by Robert Fludd in 1638. This was a vertical tube, with a bulb at the top and the end immersed in water. The level of water in the tube is controlled by the expansion and contraction of the air, so it is what we would now call an air thermometer. The first person to put a scale on a thermoscope is variously said to be Franceso Sagredo or Santorio Santorio in about 1611 to 1613. The word thermometer (in its French form) first appeared in 1624 in La Récréation Mathématique by J. Leurechon, who describes one with a scale of 8 degrees. The above instruments suffered from the disadvantage that they were also barometers, i.e. sensitive to air pressure. In about 1654 Ferdinando II de' Medici, Grand Duke of Tuscany, made sealed tubes part filled with alcohol, with a bulb and stem, the first modern-style thermometer, depending on the expansion of a liquid, and independent of air pressure. Many other scientists experimented with various liquids and designs of thermometer. However, each inventor and each thermometer was unique—there was no standard scale. In 1665, Christian Huygens suggested using the melting and boiling points of water as standards, and in 1694 Carlo Renaldini proposed using them as fixed points on a universal scale. In 1701, Isaac Newton proposed a scale of 12 degrees between the melting point of ice and body temperature. Finally in 1724 Daniel Gabriel Fahrenheit produced a temperature scale which now (slightly adjusted) bears his name. He could do this because he manufactured thermometers, using mercury (which has a high coefficient of expansion) for the first time and the quality of his production could provide a finer scale and greater reproducibility, leading to its general adoption. In 1742 Anders Celsius proposed a scale with zero at the melting point and 100 degrees at the boiling point of water. In 1866, Sir Thomas Clifford Allbutt invented a clinical thermometer that produced a body temperature reading in five minutes as opposed to twenty. Thermometers have been built to measure temperature by a range of physical effects. Most thermometers are originally calibrated to a constant-volume gas thermometer. Temperature sensors are used in a wide variety of scientific and engineering applications, especially measurement systems. Temperature systems are primarily either electrical or mechanical, occasionally inseparable from the system that they control. Some of the various types of thermometers are described below. Close up of a maximum thermometer. The break in the column of mercury is visible. A mercury-in-glass thermometer, invented by German physicist Daniel Gabriel Fahrenheit, is a thermometer consisting of mercury in a glass tube. Calibrated marks on the tube allow the temperature to be read by the length of the mercury within the tube, which varies according to the temperature. To increase the sensitivity, there is usually a bulb of mercury at the end of the thermometer which contains most of the mercury; expansion and contraction of this volume of mercury is then amplified in the much narrower bore of the tube. The space above the mercury may be filled with nitrogen or it may be a vacuum. The thermometer was used by the originators of the Fahrenheit and Celsius temperature scales. Anders Celsius devised the Celsius scale, which was described in his publication the origin of the Celsius temperature scale in 1742. Celsius used two fixed points in his scale: the temperature of melting ice and the temperature of boiling water. This wasn't a new idea, since Isaac Newton was already working on something similar. The distinction of Celsius was to use the melting temperature and not the freezing temperature. The experiments for reaching a good calibration of his thermometer lasted for two winters. By performing the same experiment over and over again, he discovered that ice always melted at the same calibration mark on the thermometer. He found a similar fixed point in the calibration of boiling water vapour (when this is done to high precision, a variation will be seen with atmospheric pressure). At the moment that he removed the thermometer from the vapor, the mercury level climbed slightly. This was related to the rapid cooling (and contraction) of the glass. The air pressure influences the boiling point of water. Celsius claimed that the level of the mercury in boiling water is proportional to the height of the barometer. Place the cylinder of the thermometer in melting pure water and mark the point where the fluid in the thermometer stabilises. This point is the freeze/thaw point of water. In the same manner mark the point where the fluid stabilises when the thermometer is placed in boiling water vapor. Divide the length between the two marks into 100 equal pieces. These points are adequate for approximate calibration but both vary with atmospheric pressure. Nowadays, the triple point of water is used instead (the triple point occurs at 273.16 kelvins (K), 0.01 °C). Mercury solidifies (freezes) at -38.83 °C (-37.89 °F) and so may only be used at higher temperatures. Mercury, unlike water, does not expand upon solidification and will not break the glass tube, making it difficult to notice when frozen. If the thermometer contains nitrogen the gas may flow down into the column and be trapped there when the temperature rises. If this happens the thermometer will be unusable until returned to the factory for reconditioning. To avoid this some weather services require that all mercury thermometers be brought indoors when the temperature falls to -37 °C (-34.6 °F). In areas where the maximum temperature is not expected to rise above -38.83 °C (-37.89 °F) a thermometer containing a mercury-thallium alloy may be used. This has a solidification (freezing) point of -61.1 °C (-78 °F). A special kind of mercury thermometer, called a maximum thermometer, works by having a constriction in the neck close to the bulb. As the temperature rises the mercury is pushed up through the constriction by the force of expansion. When the temperature falls the column of mercury breaks at the constriction and cannot return to the bulb thus remaining stationary in the tube. The observer can then read the maximum temperature over a set period of time. To reset the thermometer it must be swung sharply. This is similar to the design of a medical thermometer. Mercury thermometers are still widely used in meteorology, but they are becoming increasingly rare for other uses, as many countries have banned them outright from medical use. Some manufacturers use a liquid alloy of gallium, indium, and tin (galinstan) as mercury replacement. The typical "fever thermometer" contains between 0.5 to 3 g (.3 to 1.7 dr) of elemental mercury. Swallowing this amount of mercury would, it is said, pose little danger but the inhaling of the vapor could lead to health problems. In the United States, both the American Academy of Pediatrics and the United States Environmental Protection Agency recommend that alternative thermometers be used in the home. Never walk through the mercury spill and prevent others from doing so. Do not touch the spills with bare hands; use latex gloves instead. Never use a vacuum cleaner to clean up the spills. Doing so only increases the amount of dangerous mercury vapor in the air. Never use a brush or broom to clean up the spills. Doing so will only make the mercury beads smaller and spread them. Do not wash mercury-contaminated clothes in the washing machine. They may spread contamination to your washing machine and pollute water. Do not walk around in contaminated clothes or shoes. Mercury is hazardous waste—do not throw it in a regular waste container. Contact your local authorities to find sites and procedures of hazardous waste disposal. Resistance thermometers, also called resistance temperature detectors (RTDs) or electrical resistance thermometers, are temperature sensors that exploit the predictable change in electrical resistance of some materials with changing temperature. As they are almost invariably made of platinum, they are often called platinum resistance thermometers (PRTs). They are slowly replacing the use of thermocouples in many industrial applications below 600 °C. The application of the tendency of electrical conductors to increase their electrical resistance with rising temperature was first described by Sir William Siemens at the Bakerian Lecture of 1871 before the Royal Society of Great Britain. The necessary methods of construction were established by Callendar, Griffiths, Holborn, and Wein between 1885 and 1900. There are two broad categories, "film" and "wire-wound" types. Film thermometers have a layer of platinum on a substrate; the layer may be extremely thin, perhaps 1 micrometer. Advantages of this type are relatively low cost and fast response. Such devices have improved in performance although the different expansion rates of the substrate and platinum give "strain gauge" effects and stability problems. Wire-wound thermometers can have greater accuracy, especially for wide temperature ranges. The coil diameter provides a compromise between mechanical stability and allowing expansion of the wire to minimize strain and consequential drift. The current international standard which specifies tolerance and the temperature to electrical resistance relationship for platinum resistance thermometers is IEC 751:1983. By far the most common devices used in industry have a nominal resistance of 100 ohms at 0 °C, and are called Pt-100 sensors ('Pt' is the symbol for platinum). The sensitivity of a standard 100 ohm sensor is a nominal 0.385 ohm/°C. RTDs with a sensitivity of 0.375 and 0.392 ohm/°C are also available. Resistance thermometers are constructed in a number of forms and offer greater stability, accuracy and repeatability in some cases than thermocouples. While thermocouples use the Seebeck effect to generate a voltage, resistance thermometers use electrical resistance and require a small power source to operate. The resistance ideally varies linearly with temperature. Resistance thermometers are usually made using platinum, because of its linear resistance-temperature relationship and its chemical inertness. The platinum detecting wire needs to be kept free of contamination to remain stable. A platinum wire or film is supported on a former in such a way that it gets minimal differential expansion or other strains from its former, yet is reasonably resistant to vibration. Commercial platinum grades are produced which exhibit a change of resistance of 0.385 ohms/°C (European Fundamental Interval) The sensor is usually made to have a resistance of 100Ω at 0 °C. This is defined in BS EN 60751:1996. The American Fundamental Interval is 0.392 Ω/°C. Resistance thermometers require a small current to be passed through in order to determine the resistance. This can cause resistive heating, and manufacturers' limits should always be followed along with heat path considerations in design. Care should also be taken to avoid any strains on the resistance thermometer in its application. Lead wire resistance should be considered, and adopting three and four wire connections can eliminate connection lead resistance effects from measurements. RTDs in industrial applications are rarely used above 660 °C. At temperatures above 660 °C it becomes increasingly difficult to prevent the platinum from becoming contaminated by impurities from the metal sheath of the thermometer. This is why laboratory standard thermometers replace the metal sheath with a glass construction. At very low temperatures, say below -270 °C (or 3 K), due to the fact that there are very few phonons, the resistance of a RTD is mainly determined by impurities and boundary scattering and thus basically independent of temperature. As a result, the sensitivity of the RTD is essentially zero and therefore not useful. Compared to thermistors, platinum RTDs are less sensitive to small temperature changes and have a slower response time. However, thermistors have a smaller temperature range and stability. These elements nearly always require insulated leads attached. At low temperatures PVC, silicon rubber or PTFE insulators are common to 250°C. Above this, glass fibre or ceramic are used. The measuring point and usually most of the leads require a housing or protection sleeve. This is often a metal alloy which is inert to a particular process. Often more consideration goes in to selecting and designing protection sheaths than sensors as this is the layer that must withstand chemical or physical attack and offer convenient process attachment points. A liquid crystal thermometer or plastic strip thermometer is a type of thermometer that contains heat-sensitive liquid crystals in a plastic strip that change color to indicate different temperatures. Liquid crystals possess the mechanical properties of a liquid, but have the optical properties of a single crystal. Temperature changes can affect the color of a liquid crystal, which makes them useful for temperature measurement. The resolution of liquid crystal sensors is in the 0.1°C range. Disposable liquid crystal thermometers have been developed for home and medical use. Liquid crystal thermometers portray temperatures as colors and can be used to follow temperature changes caused by heat flow. They can be used to observe that heat flows by conduction, convection, and radiation. These thermometers are often used when someone is ill and for other medical reasons. ↑ Robert Briffault, 1938, The Making of Humanity. London, UK: G. Allen & Unwin ltd.
↑ Al-Hayani, Fatima Agha. 2005. Islam and Science: Contradiction or Concordance. Zygon. 40:3:565-576. ↑ J.E. Drinkwater, 1832, Life of Galileo Galilei. Boston, MA: W. Hyde & company. ↑ Santorio Santorio. The Galileo Project. Retrieved November 3, 2007. ↑ Sir Thomas Clifford Allbutt. Encyclopædia Britannica. Retrieved November 3, 2007. ↑ What is the difference between celsius, centigrade and celsius?, S Brannan & Sons Ltd. Retrieved April 23, 2008. ↑ Mercury and the Environment. Environment Canada. Retrieved November 3, 2007. ↑ Mercury and Human Health. Health Canada. Retrieved November 3, 2007. ↑ AAP Supports Elimination of Mercury-Containing Thermometers. American Academy of Pediatrics. Retrieved November 3, 2007. ↑ Things are Heating Up with Mercury in Thermometers. EPA. Retrieved November 3, 2007. ↑ Technical Report: Mercury in the Environment: Implications for Pediatricians. American Academy of Pediatrics. Retrieved November 3, 2007. ↑ Mercury Fever Thermometer Take Back. Environment Canada. Retrieved November 3, 2007. ↑ Guidelines for mercury spills removal. EPA. Retrieved November 3, 2007. ↑ Walter Glogowski, 2003, Liquid Crystals. University of Chicago. Retrieved November 3, 2007. Thermometer. About.com. Retrieved November 3, 2007.
Notable Modern Inventions and Discoveries. History Channel. Retrieved November 3, 2007. Middleton, W.E. Knowles. 2002. A History of the Thermometer and Its Use in Meteorology. Baltimore, MD: The Johns Hopkins University Press. ISBN 0801871530. Resistance Thermometer. Peak Sensors. Retrieved November 3, 2007. Richardson, Adele. 2000. Thermometers (Science Tools). Mankato, MN: Capstone Press. ISBN 0736849599. Trumbauer, Lisa. 2004. What Is a Thermometer. New York, NY: Children's Press. ISBN 0516246119. This page was last modified on 25 November 2015, at 16:17.